Need more information about booking Home 6960144 ? Drinking water on tap, no need for bottled water. Maximum 5 persons (double bed, 2 single beds, double sofa bed). Completely refurbished to very high standard. New fully fitted kitchen to include all cooking dinning and washing facilities. New walk in shower room. Fitted mirrored wardrobes to both bedrooms. Communal swimming pool and separate child pool with new sun loungers & parasols. 100m from large beach and resort amenities. Quiet complex of only 19 privately owned plots set in mature gardens. Ideal location for families or couples who want to relax yet be within minutes of all the resort's amenities. 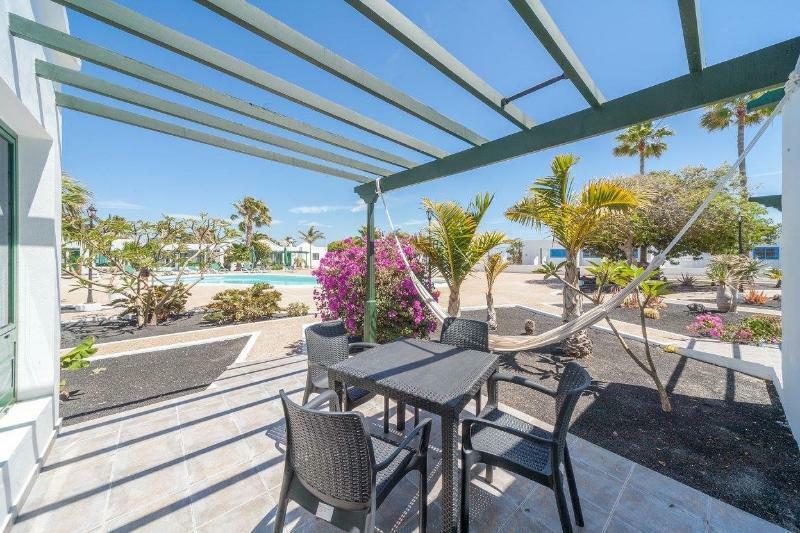 The island of Lanzarote boasts year round great weather with winter daily temperatures always over 20 degrees and summer daily temperatures over 30 degrees. Available for weekends, weeks, fortnights or daily bookings immediately. No smoking within the property! You can get in touch with Ross (the owner) through the contact form on this page. Send Ross (the owner) an email through the contact form on this page. Alternatively, if there’s a phone number on this page, you can call them. How do I contact Ross (the owner)? If you’ve already booked, go to Manage your holiday booking to view Ross the owner's contact details or send them a message. Or send Ross (the owner) an enquiry through the Contact the owner/manager form if you’d like a quote or more info first. When you pay online through the Book your stay form, a booking request is sent to Ross (the owner). You’ll find out within 24 hours whether they’ve accepted - no money will leave your account before then. You can also request a quote from Ross (the owner) through the contact form. The owner will email you the total cost for your dates and a link to book and pay online. Use the Book your stay form to pay provisionally online. You can pay by credit/debit card or PayPal. Ross (the owner) will have 24 hours to accept the booking and no money will leave your account before then. Why can't I call Ross (the owner) before booking? You’ll need to contact Ross (the owner) to do this. Send them a message in Manage your holiday booking or through the contact form on this page. You can request to change the dates or number of people on your booking via the Manage your holiday booking page. To change your holiday dates use the Edit booking button. If you need to change the number of guests staying then send Ross (the owner) a message. If Ross (the owner) agrees, they’ll send you a revised quote outlining the changes. You can review and accept/decline this from the Manage your holiday booking page. You’ll have 48 hours to take action before the revised quote expires.